Author Karen Robertson’s newly released “The Turnaround” tells the misadventures of a forty-year-old school teacher named Grace whose life is about to change forever. “The Turnaround” from Christian Faith Publishing author Karen Robertson is a series of misadventures surrounding Grace, a forty-year-old school teacher who struggles with an empty marriage. When Grace decides to do something different and take a ride on the Gambler’s express, an unexpected accident leads to a journey filled with deception, double-dealing, dishonesty, drugs, and deliverance. Published by Christian Faith Publishing, Karen Robertson’s new book is a series of misadventures filled with twists and turns. Grace is a forty-year-old school teacher who is struggling with anxiety and a workaholic husband who has no time for her. Her husband, Philip, is a real estate mogul whose only concern is the next big deal. They have no children and their life together is empty. Grace is no gambler, but she hops on the Gambler’s Special in an effort to escape reality for twenty-four hours as she considers the future of her marriage. Thanks to an unexpected tragedy, Grace is faced with a decision that will change the course of her life and her name while putting her in great danger. Law enforcement, private investigators, a pastor, a bar maid, an old woman, and two greasy tow truck drivers soon become part of Grace’s turnaround story. She will face deception, double-dealing, dishonesty, drugs, and deliverance with humor sprinkled along the way. View a synopsis of “The Turnaround” on YouTube. 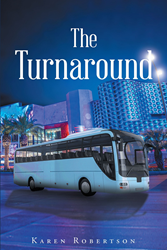 Consumers can purchase“The Turnaround” at traditional brick & mortar bookstores, or online at Amazon.com, Apple iTunes store, Kobo or Barnes and Noble. For additional information or inquiries about “The Turnaround”, contact the Christian Faith Publishing media department at 866-554-0919.